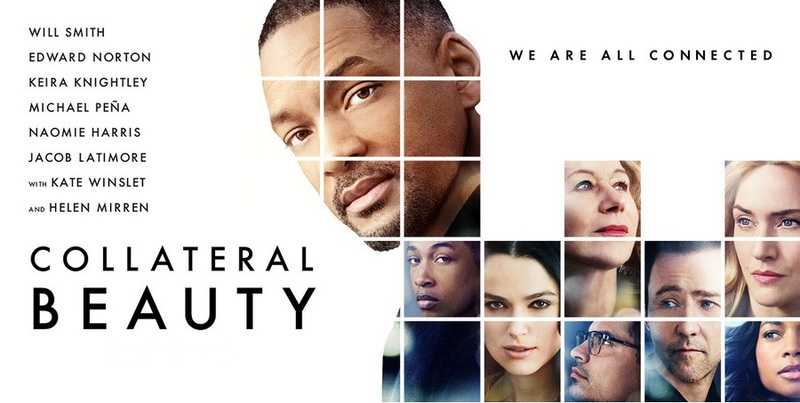 Review of the film Collateral Beauty (2016) of the project What is good. 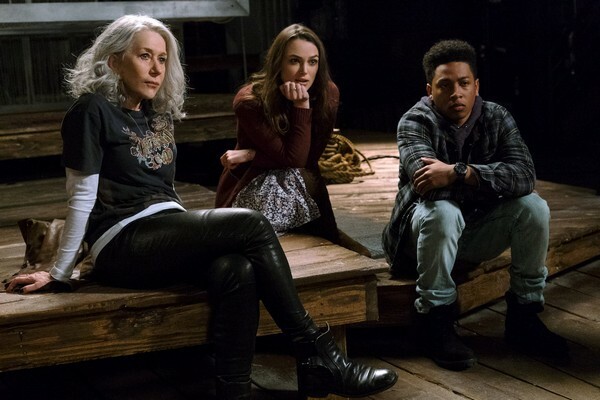 The film “Collateral Beauty” was released on December 15, 2016 and gathered a whole constellation of popular Hollywood actors. Thanks to the original (rather classic, but forgotten) idea of communion of a lost and desperate man with the Universe, right after the release of the trailer, it aroused interest of the audience. This movie contains many significant points and answers from an area of how a person should perceive the world around and build his life. Howard (Will Smith) is a successful executive of the advertising company. He’s always believed that humanity hangs on three pillars – everyone looks for love, fears death and regrets the lost time. After his daughter’s death, the main character has been in a state of depression for several years and done nothing but line up dominoes to topple them afterwards. He also writes messages-challenges – letters to Love, Death and Time – in which he humiliates Death, says goodbye to Love and calls Time – “imperishable dead man”. His company will soon collapse, and in order to save it, Howard’s three friends decide to take a desperate move. When by chance they run into three actors, an unexpected idea comes to their mind. They decide to hire these actors so that they would talk to Howard on behalf of Love, Death and Time. Actors’ strange behaviour and their unexpected willingness to help Howard’s friends, who got mired in problems, beg the question – what if they are really the ones they pretend to be and came to help not only Howard? Each of the actors-abstractions and their tandem with Howard’s friends turned out to be a little parable with a question and an answer. Claire Wilson (Kate Winslet) is a woman getting already out of her middle age. She worked hard for the benefit of the company and her own financial status, and with all that she had no time to create a family. Now, having realized this great life omission, she’s desperately trying to conceive a child at least artificially, but she still can’t decide on it. Raffi (“Time”), however, tells her strange things. As if time is nothing more than an illusion, and Claire still has plenty of it to become a mother. It sounds absolutely illogical till the moment Claire realizes that being a mother means not only giving birth to a child. Viewer isn’t informed directly how exactly she’s going to solve her problem: whether she will adopt a child or give her mother’s love to children through charity or somehow else. The issue remains open for the viewer. Thus people around and Claire herself often recall that she made a mistake and lost time entrusted to her. But this mistake, this tragedy, which happened in her life, isn’t the reason to lose heart and spend the rest of days in loneliness. Actually, this is one of the main messages of the film – that mistakes, problems and tragedies are no reason to stop living, hoping and loving. “Nothing is over for someone who is alive”. Attracted to women Whit Yardshaw (Edward Norton) got divorced after a sudden marriage. It’s not hard to figure out that the reason for divorce was his unfaithfulness. After that his daughter’s mother prejudiced the child against her father, and now the girl hates him. Though Whit feels the bitterness, he decides to take his mind off family problems. He falls in love again, this time with Amy (Love). Love encourages Whit to spend all his energy and persistence not to seduce women, but rather to win back love of his family member, one of the closest people in the world – his own daughter. After conversations with Amy, Whit begins to understand that Love lives in all existing things and in all living beings on the Earth: love is in children’s laughter, in pain, in hope and in fear. The whole world is imbued with love, but especially holy is love of a parent for his child. “I didn’t love; it was as if I myself was love!” – said Whit about the moment of his first meeting with a newborn daughter. From Love’s mouth we can hear that she is “everywhere”, everything breathes with it, and everything lives for and because of it. Such a philosophy, presented to the viewers, echoes religious perception of the world, which claims that God is Love, and all the people, one way or another, are part of God. 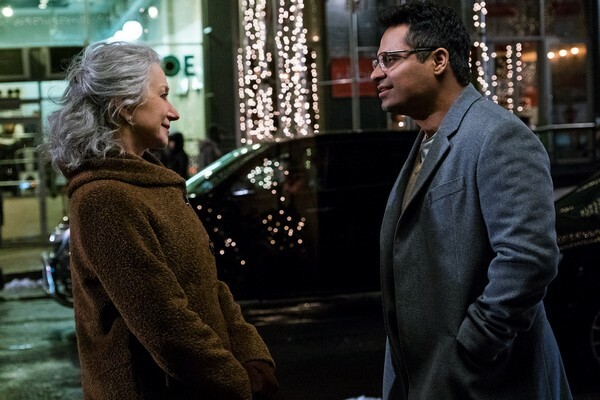 Simon (Michael Peña), apart from Howard, is the most miserable of the characters, since he’s got to die from the lethal disease, which he’s been fighting against for all his life. During the remaining months of his life, Simon is trying to financially provide for his family, but he doesn’t say to his wife what awaits him. Communication with Brigitte forces this character to share his grief with loved ones. Having found out about Simon’s plight, Howard swears an oath that his wife and son won’t lack anything in future. And, of course, Simon’s wife supports him as much as it possible. This story tells us that we should share with our friends and loved ones not only joy, but grief also, because it’ll help to withstand tragic moments of life. Howard’s story, how he has defied all three abstractions, develops the main idea of the film, which is revealed through Howard’s fondness for domino that symbolizes common interconnection of all the elements in the Universe. He meets a woman – Madeleine (Naomie Harris), who also got through similar grief in the past, but found the strength to live and help others. Howard tells her about his communication with Love, Death and Time; yet she doesn’t regard him as a madman, but makes it clear that the Universe is trying to commune with him and remind about “collateral beauty” – quiet sense of unity and harmony with the world, feeling of love for every living thing, which overwhelms our souls. At first, Howard doubts that, but certain sobering talking at the end of the film as well as unexpected and unpredictable plot twists will help him and us to believe. The second idea, which runs through Howard’s story – is an idea that any grief should be expressed, realized and abandoned. Somehow this line echoes Simon’s story, when he, instead of being alone with his pain, ought to tell about feelings tormenting his soul to everyone who’s willing to listen, and permit his loved ones to help. Not only did Howard not sign his daughter’s death certificate for two years, but he even couldn’t utter her name, thus having worsened his depression. There is one rather controversial point in the film, namely, the motive of Howard’s friends – Whit, Simon and Claire. As mentioned before, Howard doesn’t run his company’s business, as a result his business is about to get derailed. Holding half of company shares, Howard doesn’t dedicate time even to signing documents; which is why his friends who are also his colleagues, students and employees, decide to take a desperate move: they hire actors from the nearest impoverished theatre so that to represent Howard in unfavorable light before the board of directors and to picture him as completely insane. From the material standpoint they do not seek to harm him; their main goal is that Howard would sell his shares to Whit so that he’ll be able to run the company. Naturally, the characters don’t consider the fact that Howard may feel really distraught and do stupid things, and, if it weren’t for a fairytale-Christmas background of the story, his «best friends’» action could have ended sadly. However, this film is unusual in that the way of transformation is laid out here for all characters, not just for Howard. Though for their despicable action Whit, Simon and Claire don’t get direct punishment, and Howard forgives them not knowing the whole point of the matter (he learns only about hidden cameras and spying on himself), each of them eventually realized what they’d done was wrong. The characters often talk about it in the shot, and Claire even tries to confess, but she is prevented from it, since it “would kill Howard completely”. Despite a peculiar improvement of characters, such a delayed “concern for Howard” looks a little hypocritical, and it would be more honest to speak frankly about what happened. Sexual promiscuity is mentioned, but gently denounced. 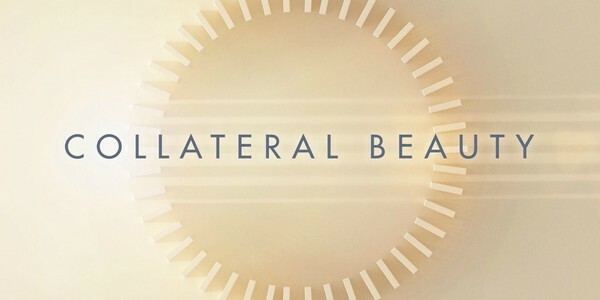 Messages intended by the film “Collateral Beauty” are obvious, simple and in some respect even trivial. But these are exactly eternal ideas, like importance of communication with people we love, careful use of our time, ability to overcome fear and pain, to preserve sense of beauty; and we should remind other people of these valuable ideas as often as possible. The film helps us to maintain or regain a sense of unity and harmony with the world, a feeling of love for all living beings.